Between filling in your roles as a mum and as a professional woman with a full time job, taking care of yourself can easily fall by the wayside. Fast, tasty and healthy meals can be a life saver. You think quinoa sounds healthy but doesn’t fit in the tasty category? 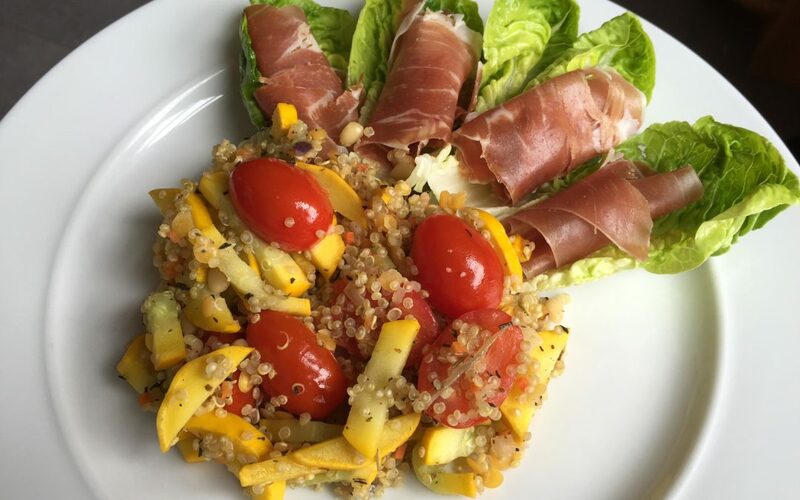 I used to believe that too and have since found out that you can be super creative with quinoa and turn it into a delicious ingredient of easy to make meals. Today I tried yellow courgette which I’ve never had before. heat up some coconut oil in a frying pan on medium temperature. Peel the onion and cut it in half (cutting from it’s base to its tip). Cut one half in small pieces and the other half in 6 wedges. Fry the pieces and the wedges until they go soft. Meanwhile cut the courgette into pieces (I cut it into circles and then sliced the circles into sticks) and then add them to the onion. Season with freshly ground black pepper, salt (I like to use herb salt), thyme and garlic powder. Add the quinoa to the vegetables when it’s done (the water should be completely gone). Taste to see if you need more of pepper, salt, thyme or garlic powder (don’t forget the salad dressing will add extra flavour). Add the cherry tomatoes (cut in half). Arrange about 5 leaves of the lettuce hearts on the side of the plates and place rolls of parma ham into their middle. 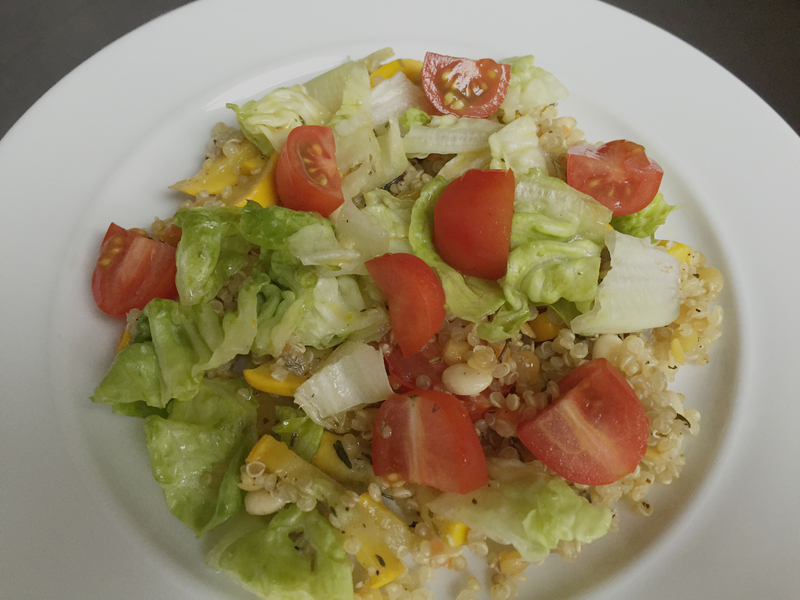 Spoon the quinoa mixture next to the lettuce and sprinkle everything with salad dressing. Any left-overs are very tasty cold too. Just add some extra lettuce and tomatoes and if you like some more parma ham. If you keep the salad dressing separate it makes a great portable lunch as well. A lunch box with cool pack, cutlery and separate container for the dressing makes it super easy to take left-overs to the office or school :-). 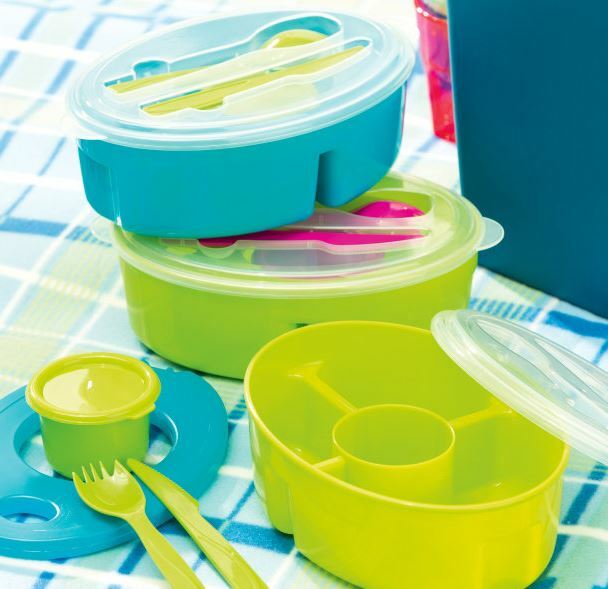 The one you see on the picture is from Aldi, I’ve found plenty more by googling “lunchbox met koelelement”.